Centrally located off the Brooklyn Queens Expressway, Rose Castle is your royal palace just minutes from anywhere. 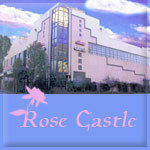 An affair at the Rose Castle will be a beautiful memory to treasure forever. Get more for your wedding! Don't forget to mention ChossonKallah.com when visiting Rose Castle. the service and the menu was not what we expected. we were very disappointed. Before the wedding even started the manager wanted us to pay all the money upfront, while the photographers were waiting over an hour to take pictures of chasson and kalla and the parents. Wasted so much time and putting so much pressure on the chasson to pay right away, when everything could have been done after the wedding.